This nifty add-on helps you silence pesky auto-playing audio and video that you come across on the web--as long it's not Flash-based. Mozilla is already working on the ability to detect and silence tabs with auto-playing audio or video in Firefox, and I recently told you about a Firefox add-on called Open Link in Silent Tab that helps you take control of noisy tabs. Today, I’d like to revisit the topic and tell you about another add-on called Noise Control that works similarly to Chrome’s noisy tab-stopping feature, as well as what Firefox is working on. The big difference with Noise Control is that it’s far more intuitive to use than Silent Tabs. It also goes a long way to silencing select auto-play videos. That’s especially true if you’ve gone anti-Adobe Flash Player, because Noise Control only works with HTML5-based content, not Flash. The good news is there’s a whole lot of HTML5 content on the web, including sites like YouTube. Noise Control at work. Note the audio icon in the tab. First, download and install the Noise Control add-on for Firefox. Once that’s done, try it out by visiting a site playing HTML5-based video, such as anything on YouTube or this PCWorld story—if you aren’t running Flash. 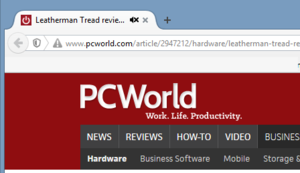 When HTML5-based content starts playing, an audio icon will appear on the tab itself. Click that and an “x” appears on the icon meaning the noise is silenced. This feature is great, and to guarantee it works whenever possible you might even consider disabling Flash on your system completely. You may lose video functionality on a few niche sites that are Flash-only, but for the most part sites will just feed you an HTML5 version instead.